The Commonwealth Bank of Australia has released its annual report for the 2018 financial year. 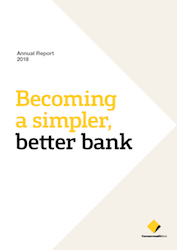 The report includes a comprehensive view of the Bank’s non-financial progress and performance and is supplemented by a number of Spotlight articles detailing the Bank’s approach to financial education, financial wellbeing, diversity and inclusion, customer advocacy and climate change. Kylie Macfarlane, General Manager Corporate Responsibility, Commonwealth Bank, believes the newly combined report sets out the contribution being made by the Bank and its commitment to responsible and sustainable business practices. “More than 49,000 dedicated people serve more than 16 million customers across Australia and countries around the world. We reached a number of milestones across community investments, students accessing financial education, lending to renewable energy projects and cultural diversity in our workforce to name a few”, Macfarlane says. Commonwealth Bank of Australia is one of the largest listed companies on the Australian Securities Exchange and the most recognised brand in the Australian financial services industry. The Group provides retail, private, business and institutional banking services to more than 16 million customers in 11 countries.